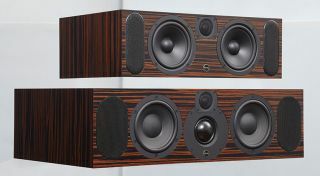 PMC announces Fact centre channel speakers | What Hi-Fi? It's been five years since we last reviewed the PMC Fact series, but now the company has introduced two new centre channel speakers designed to tonally match the rest of the Fact range, and to create a surround sound system. The two-way Fact.5c is intended to complement the Fact.3 and Fact.8 loudspeaker models, while the three-way Fact.10c can be used with the Fact.12. Both centre speakers feature PMC’s new Advanced Transmission Line technology, which the company says “has been tuned for the ultimate in local clarity and projection”. Damping materials and cabinet bracing have also been used to reduce colouration and produce an “untainted vocal reproduction”. The same Fact series drive units found in the Fact.3 and .8 have been used in the centres, but the tweeter has been redesigned to work with smaller, higher power, neodymium magnet technology. Bass and treble tonal controls are available to adjust settings and the Fact.10 has a bass boost function too. Pricing and availability of the new centre speakers has yet to be announced, but both models will be on display at the Bristol Show.